Hot Towel Beauty Cabinet - CAPR012. Stock availability: Not in stock. Price does not include freight. Your delivery post code will be required to calculate this. Capacity is 12 litre and holds up to 13 Face Towels depending on their size and thickness. Heats up to 80° C and has glass wool insulation to keep the heat maintained longer. Includes 2 wired metal trays which are removable. Door opens from left to right and and has a silicon seal on the inside. Exterior dimensions - 420 x 285 x 290 mm (Width x Depth x Height). Interior dimensions - 340 x 195 x 180 mm (Width x Depth x Height. Condensation is drained to the drip tray installed at the base of the unit. Includes a thermal fuse which is a temperature safety device. Warranty - 12 months return to base. What is the benefit of using the UV Lamp? While the the unit warms the Hot Towels there is an option to also keep them free from bacteria through the operation of the UV sanitiser. What is the purpose of the thermal fuse? This is found in most Hot Towel Cabis and works like a normal Electrical fuse but is based on temperature rather than on current. So if the temperature gets excessively high and outside its specified range the fuse will cease working and will need replacing. The result being that the current is stopped being sent to the heating element. This is a back up safety mechanism for when the thermostat is not functioning properly. Who is the main group that buy this item? Main purchasers of this Warmer have been Massage, Barber and Hairdressing Salons. Operating instructions document: Download PDF file. Compact Hot Towel Cabinet - 11 litre. UV Towel Warmer - 11 litre. Medium sized 18 litre Hot Towel Cabi. 18 litre Hot Towel Warmer. 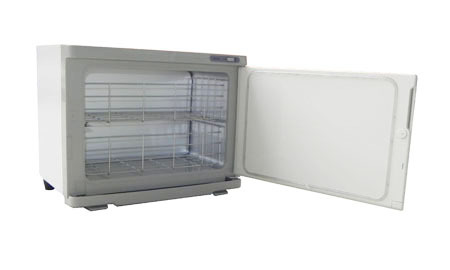 Twin door 30 litre Hot Towel Cabinet. 2 door 32 litre Hot Towel Warmer. Large 82 litre Massage Towel Warmer. Screw in type replacement UV globe. Non screw in type replacement UV globe.